Changed app name to "DECKU Flashcard"
DECKU Flashcard can use with vocabulary, formulas or any subject matter that can be learned via a question and answer format. - Make your own customize flashcard decks. (Supports text, photo and audio both 2 sides of card). - Learning from ready-made cards. - Easy play with user friendly interface. - Easy navigation, tap to answer and swipe to next questions. - Quick shortcut by scrolling question number. - Keep track of the cards you know by checking/unchecking them and only studying the ones you know or don't know. - Shortcut mark "I Know" by swipe up and mark "Don't know" by swipe down. - Choose playing by card by ordering mode (alphabet A-Z or Z-A) or shuffle mode. 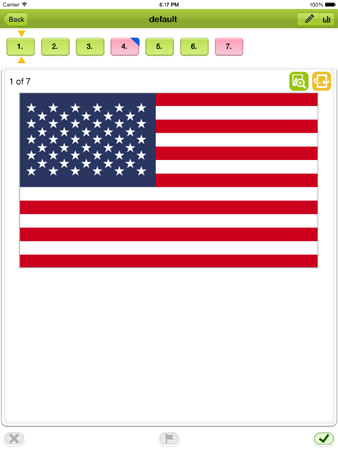 - Choose playing by card filtering : flag only, exclude flagged, mistake only, none. - Text to speech (TTS) up to 30+ languages. - View your statistics after play. - Easy create and edit your own flashcards. - Supports text, photo and audio both 2 sides of card. - Use “Siri” at keyboard to help you transform your voice to text when create cards. - Manage cards by multiple cards selection. - Copy or move cards to another deck. - Organize and re-order your cards or card sets. - Sorting card by alphabet A-Z or ordering. - Adjust font size and align. - Supports Dropbox and iTunes file transfers (with .csv and .txt files). - Sharing card set to other users via airdrop, email and message. - You can see how to use the app in “How to” menu. *This version has a LIMIT of 2 decks but unlimit cards per deck. The in-app purchase no limits on the number of decks. © Copyright 2019 www.deckuflashcard.com All Rights Reserved.